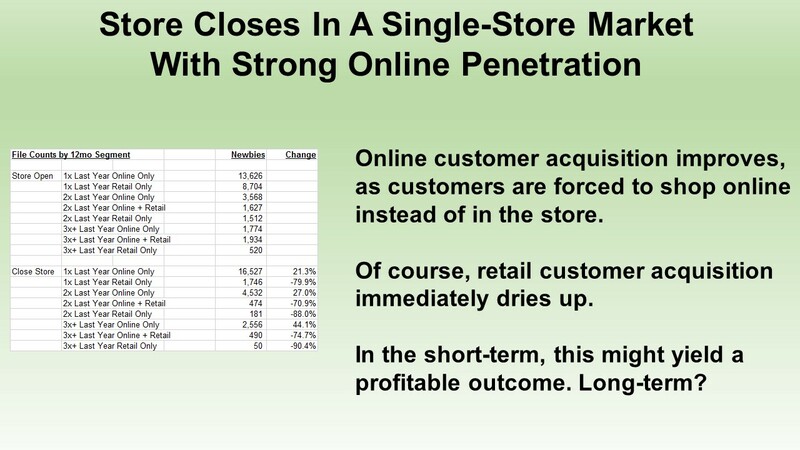 Kevin Hillstrom: MineThatData: Does The Online Channel Solve Customer Acquisition Problems When Stores Close? Does The Online Channel Solve Customer Acquisition Problems When Stores Close? The answer to that question is "sometimes". In our example, retail customer acquisition is (predictably) crushed when a store is closed. But look at the online-only segments ... +21% / +27% / +44%. With a strong online presence, customers did shift some of their behavior from the closed store to the online channel. That's the dream, isn't it? 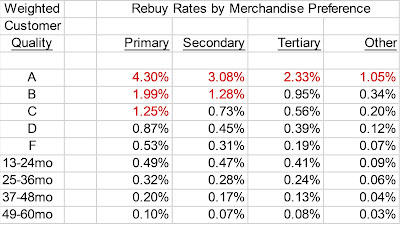 Total new customers in the trade area declined, however ... down 20%. I've seen cases where total new customers are down 80%. Marketers greatly influence what happens when a store closes. 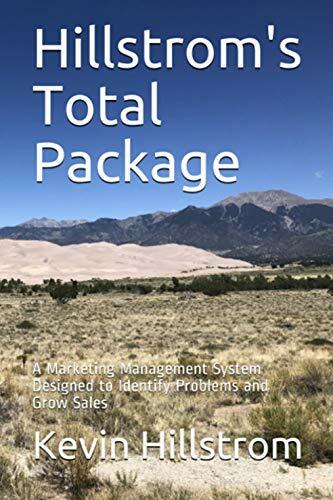 If the digital marketing team is charged with increasing new customers in the trade area where a store closes, then it is possible to mitigate new customer losses. Is your digital marketing team able to attack Oklahoma City specifically? Or Tulsa? or Boise? Or do they hand paid search off to an agency and say "no thanks, not our job"? Digital Marketing teams that align with Real Estate Teams are able to mitigate the myriad customer development problems associated with a store closure. Please give this some thought as you close stores, ok?